One of Australia’s most remarkable natural gifts, the Great Barrier Reef is blessed with the breathtaking beauty of the world’s largest coral reef. The reef contains an abundance of marine life and comprises of over 3000 individual reef systems and coral cays and literally hundreds of picturesque tropical islands with some of the worlds most beautiful sun-soaked, golden beaches.Because of its natural beauty, the Great Barrier Reef has become one of the worlds most sought after tourist destinations. A visitor to the Great Barrier Reef can enjoy many experiences including snorkelling, scuba diving, aircraft or helicopter tours, bare boats (self-sail), glass-bottomed boat viewing, semi-submersibles and educational trips, cruise ship tours, whale watching and swimming with dolphins. The marine park stretches over 3000km (1800 miles) almost parallel to the Queensland coast, from near the southern coastal town of Bundaberg, up past the northern tip of Cape York. The reef, between 15 kilometres and 150 kilometres off shore and around 65 Km wide in some parts, is a gathering of brilliant, vivid coral providing divers with the most spectacular underwater experience imaginable. A closer encounter with the Great Barrier Reef’s impressive coral gardens reveals many astounding underwater attractions including the world’s largest collection of corals (in fact, more than 400 different kinds of coral), coral sponges, molluscs, rays, dolphins, over 1500 species of tropical fish, more than 200 types of birds, around 20 types of reptiles including sea turtles and giant clams over 120 years old. The reef is a breeding area for humpback whales, migrating from the Antarctic and is also the habitat of a few endangered species including the Dugong (Sea Cow) and large Green Sea Turtle. 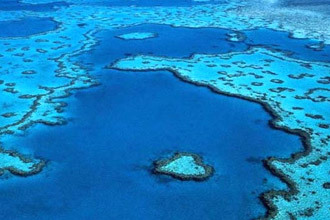 In recognition of its significance, UNESCO listed the Great Barrier Reef as a World Heritage Site in 1981. Because of its natural beauty, both below and above the water’s surface, the reef has become one of the worlds most sought after tourist destinations. In 2006 there were approximately 820 operators and 1500 vessels and aircraft permitted to operate in the Great Barrier Reef Marine Park providing ease of access for all to experience the Great Barrier Reef and learn first hand about its natural delights and World Heritage values. The Great Barrier Reef is a natural treasure and one of the world’s best managed marine areas — overall, the system retains its outstanding universal value. In recent years, a series of major storms and floods have affected an ecosystem already under pressure. Crown-of-thorns starfish outbreaks and marine debris are also affecting the area. 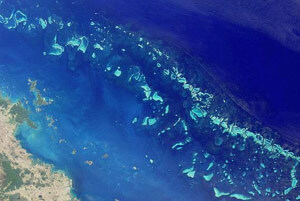 The northern third of the Great Barrier Reef Reef has good water quality and its ecosystem is in good condition. In contrast, key habitats, species and ecosystem processes in central and southern inshore areas have continued to deteriorate from the cumulative effects of impacts. The Reef is facing a range of threats over time, scale and duration — the accumulation of all impacts on the Reef has the potential to further weaken its resilience. This is likely to affect its ability to recover from serious disturbance, such as major coral bleaching events, which are predicted to become more frequent in the future. The Australian and Queensland governments’ Reef 2050 Long-Term Sustainability Plan provides an overarching framework for protecting the Reef.